If you have a 3D file you would like in glTF format, Sketchfab has the answer. They now support over 50 formats! Visit the 3D File Formats help page for more information. A 3D version of the Khronos logo has just been uploaded to Sketchfab. This brings our total models to twelve. All of the 3D logo's are available for download from Sketchfab. Vector and bitmap versions of all of the Khronos and Khronos Standards logos are available from our Logo and Trademark page. Vizard 6, the new version of the VR development platform for researchers from WorldViz now offers support for glTF. On the graphics side, Vizard embraced the new 3D model format glTF, which improves graphics rendering and provides new and simplified workflows out of Revit, Solidworks, Maya, Blender, SketchUp, Substance Painter, Modo, and more, as well as access to over 150,000 models in Sketchfab’s library. The Khronos Group standards logos are now available for download on Sketchfab. Sketchfab makes it easy for anyone to publish and find 3D content online. Available logos currently include OpenXR, OpenCL, NNEF, OpenVX, SPIR, Vulkan, WebGL, SYCL and glTF. OpenGL has not been overlooked and will be arriving shortly. Sketchfab has just announced a download API for their entire 3D catalog. The API lets you search by titles, tags, categories, polygon count and more. The initial scope of the download API lets you import content available under a Creative Common license – more than 150,000 3D models available today – in glTF format. As a step two, the API will also let you easily import your own content, as well as content you purchased on the Sketchfab store. Alongside the release of the download API, Sketchfab introduces import add-ons for Unity, Unreal and Godot, as well as native integrations with Torch3D, Minsight, Spatial stories, Selerio, StellarX, Valorem’s Holobeam, AnimVR, Plattar, Sketchbox3D and Looking Glass. Godot Engine now supports the full glTF 2.0 specification. With the release of Godot 3.0 alpha1, users needed more content to test with the new 3D engine. Sites like Sketchfab provide plenty of PBR-ready assets for downloading, and plugins that export scenes from other popular game engines to this format. The surprise, though, is how good this format is for video game asset exchange. Nothing as good existed before, and it solves a problem that we, as an industry, have been struggling with for a long time. Khronos, with glTF 2.0, has given us a fantastic chance to standardize a smooth workflow between 3D modelling software and game engines. To better understand why, a list of previous attempts will be explained and why they failed. 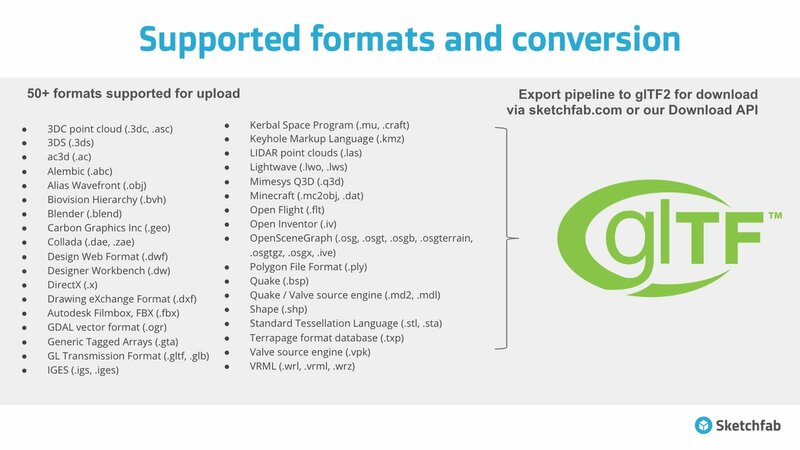 Starting today, Sketchfab is proud to announce their support of the glTF file format. Zip up your glTF file along with any accompanying assets and then drag and drop into a browser window at Sketchfab.com. This method allows you to upload glTF files no matter which 3D software package you used to create the file. The addition of glTF means we now support over 30 file formats! In addition, the Sketchfab revised Unity exporter plugin will leverage the glTF format behind-the-scene to transmit 3D files in the most efficient, accurate way possible. If you’re interested in downloading example files visit the Sketchfab glTF page. Sketchfab, a web service to publish, share and embed interactive 3D models will be giving a demo of their services, capabilities, and a general overview of what is happening in the background. Hosting the Meetup at Pivotal Labs will be the three co-founders from Paris: Cédric Pinson, Alban Denoyel, and Pierre-Antoine Passet. Sketchfab went live recently with new technology making it easy to publish interactive 3D content online. The free service does not require any third-party application installed on either the client side or the server. All Sketchfab needs is for the end-user to be running a WebGL compatible browser.